First of all, the name. 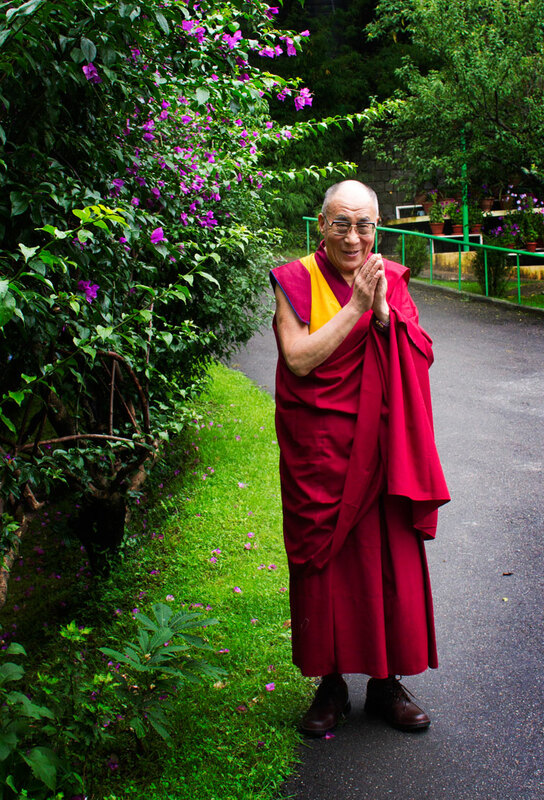 The place known around the world as Dharamsala, the home of the Dalai Lama, officially has a second ‘h’. That’s why it’s spelt ‘Dharamshala’ throughout this blog. The word means ‘place of refuge’ or ‘spiritual retreat’ in Hindi, which is appropriate enough. Apart from that, Dharamshala is many things. An unforgettably gorgeous patch of the Himalayan foothills. The global centre of Tibetan culture. The seat of the Tibetan government-in-exile. A place rich in philosophers, activists, journalists, photographers, writers, seekers, artists, mystics, wanderers, and more than a few hucksters. An old British hill station. A somewhat overbuilt and chaotic village. A tourist haven. A blessed relief from the heat and dust of the plains. A farming and shepherd community surrounded by forests and mountains alive with monkeys, birds, a few leopards and the occasional bear. The foremost centre for traditional Tibetan medicine. A foodie’s dream, with restaurants and cafés serving dishes from around the world. And much more. The wonderful thing about Dharamshala is that it is so welcoming. There are Indians from all over India, including refugees from Partition and their descendants, and plenty more who come for the business opportunities, for spiritual development or for the peaceful atmosphere. A Tibetan population has been here since the early days of exile in the 1960s, but a steady stream of new refugees arrives each year. Others move on, to other parts of India, to the West, or back to Tibet, exuding a restless energy that contrasts with the peaceful surrounds. As well as plenty of tourists, there is a permanent community of several hundred expatriates, from all over the world, but particularly from Taiwan, Korea and Western countries. They come here to study, to create, to work, to get involved. Visitors arrive expecting to stay a few days; many end up spending weeks, months, or even years. Dharamshala lies 530 kilometres north of Delhi, accessible by bus, plane or train. Rather than just one town, it is a collection of settlements. Lower Dharamshala is the commercial and administrative hub. Upper Dharamshala, better known as McLeodganj, is the centre of the Tibetan population, a tiny town packed with restaurants, hotels and shops, as well as the residence of the Dalai Lama. Gangkyi is the base of the Tibetan government-in-exile and the Tibetan Library. The Indian villages of Dharamkot, Bhagsunag and Naddi cluster around McLeodganj, and are home to Gaddi shepherd and farming communities, as well as hosting tourists. TCV, the Tibetan Children’s Village, is a school community with several thousand students, teachers and support staff. Further afield are the Tibetan settlements at Bir and Tashi Jong, a tea-growing district based around the town of Palampur, and the town of Kangra, the seat of the princely state that once bore the same name. Moonpeak is named after 4,600-metre Mun Peak, the highest point in the lower Dhauladhar range which dominates the town. The restaurant and café can be found in McLeodganj on Temple Road, the street that leads to the Dalai Lama’s temple and residence. Luxury Volvo buses run nightly between Dharamshala and Delhi’s ISBT, a 12-hour journey. Trains run from Delhi to Pathankot, two hours by taxi or three hours by bus to Dharamshala. 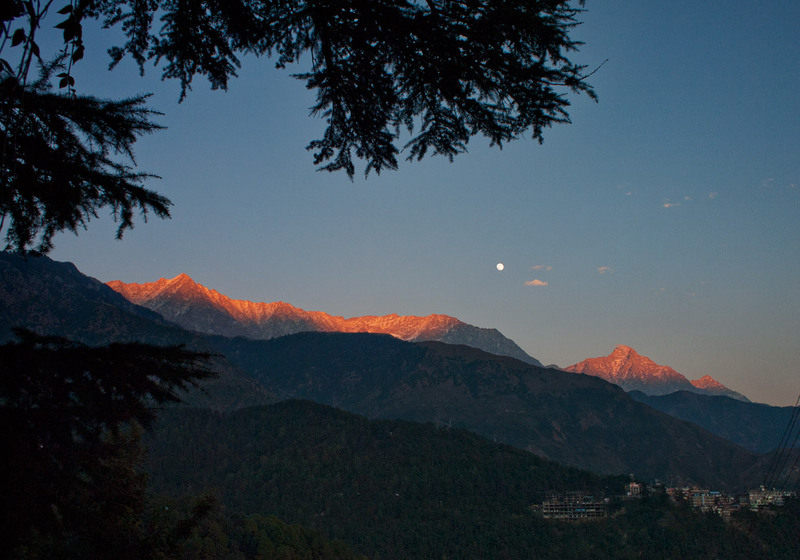 McLeodganj is nine kilometres from Dharamshala, with connections by bus, taxi or shared jeep. Dharamshala is a convenient day’s drive from Kullu, Manali, Amritsar and Chandigarh. The Gyuto monks came to stay with me for four days last month…a huge blessing.